The Mbiriizi Advanced Primary and Day Care School has grown and the needs have grown with it. Where once there were 439 students, there are now 1,000+, 25% of them orphans. These children are grateful for the basics of education, health, safety, lodging and food. They look forward to the gifts and treats that the yearly Christmas party brings held at the end of there school year on November 16 this year. Every year, for the past 14 years (we only missed the first two! ), we have put on a Christmas Party for the children. 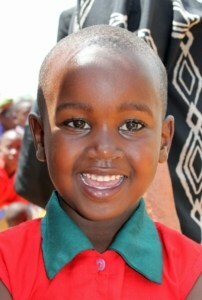 Please help us continue to bring smiles to these children’s faces. Download this form where you can indicate your donation for this wonderful event and mail it in. Every girl gets a new dress and every boy a new shirt. In many instances these are the only gifts they get so it very special. In addition each child gets a goody bag that contains sweets (candy), crayons, stickers, mardi gras beads, sunglasses, kazoos, and pencils. And if you want to know the real joy of Christmas? Join us on this trip …it will fill your heart to overflowing! Thanks for loving these children as much as I do! Please help us bring smiles to these children’s faces.